Bridget Montgomery joined the Harrisburg office in 1996. Growing up with three siblings, Bridget spent her early years in Harrisburg and relocated to New Mexico as a teenager. Today, she and her husband of 33 years, Michael Spangler, live in a historic neighborhood of Harrisburg that was established in the early 1900s. Bridget and Michael have three grown sons. Bridget notes that her family includes dozens of cousins, as her mother was one of 11 children, and her father was one of six! 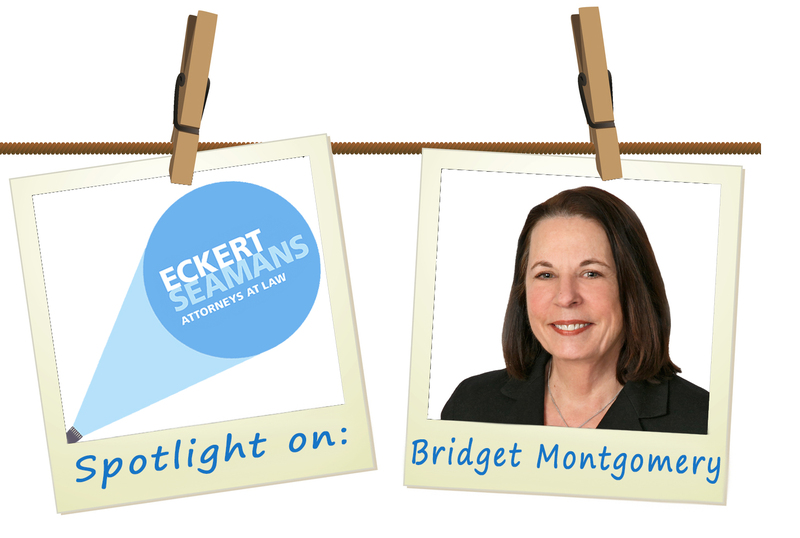 In her litigation practice, Bridget handles a wide variety of complex commercial and class action disputes before state and federal courts, agencies, and arbitration panels. Bridget’s practice includes contracts counseling and litigation, construction disputes, financial transactions, trade secrets and intellectual property counseling and litigation, shareholder and partnership disputes, consumer protection, non-competition, statutory claims, and constitutional challenges. She served two terms as a federal law clerk in the United States Court for the Middle District of Pennsylvania, and from there went on to build a federal and state practice representing business interests of many companies and individuals in various jurisdictions, including counseling, mediation, and litigation services. She is recognized for her legal skills as well as service to the bench, bar, and community. Bridget is a graduate of The Pennsylvania State University and University of Pennsylvania Law School, where she served as editor-in-chief of the Penn Law/Wharton Comparative Labor Law Journal. Practical considerations, really. Growing up, I imagined an adventurous, outdoorsy career and I pursued jobs along those lines as soon as I was old enough to work. In my early 20s, with two toddlers to provide for, I got more practical. I thought over the course of a couple years about what came naturally to me and what I cared about that would also allow me to provide well for my sons. I always spent my spare time reading and writing, had a strong analytical bent, and a fascination with the law and government, and I enjoyed solving problems. That led me to choose the law. But – I had not gone to college yet. So I started in my twenties, continuing to work various jobs until I got my first law firm job at the end of my first year of law school. Learning about the diverse businesses I have served, while helping the people who run them solve problems and succeed. A crime-solving detective nun! I came up with that at about age 8, after reading every Nancy Drew book in the series and many stories about female saints that my mother made me read. Probably my “career path” before law school. In my late teens, I spent a few years living and working on a cattle ranch in New Mexico, where I learned to ride Western style and tend to the horses and cattle. Later, I spent a couple years on Martha’s Vineyard, Massachusetts, working whatever jobs were available in the seasons – the restaurant business during the tourist season, construction odd jobs in the fall and early spring, and working on a bay scalloping boat from October to February – great fun but there were some crazy frigid days out on that water! Law school started looking better and better. Cooking for and sharing meals with family and friends, especially when we can do it outside, and growing food. In fact, I’ve transformed my small urban plot of ground in Harrisburg into a mini-farm. I dug up dozens of large ornamentals that I had planted and tended for years, and most of the lawn, and I replaced them with vegetables, fruit trees, and herb gardens. Luckily, my neighbors like it, too. Lonesome Dove, a miniseries starring Robert Duvall and Tommy Lee Jones. I can’t choose one, but here are three favorites from the last 30 years: A two-week stay in Bali, in a rustic thatched roof cottage overlooking a rushing river; a week-long trip down the Colorado River in the Grand Canyon, rafting all day and sleeping outside under the stars at night; our Christmas trips to Italy, where the focus is almost entirely on sharing time with family and friends and not so much on buying consumer goods/gifts. All the household tasks that I didn’t get done during the week. . . or sometimes I just leave it all undone and go boating. The antics of little kids, British TV comedies, our sons’ dry wit. . . Just not clowns. I really hate clowns. It sounds corny, but it’s true – my husband Mike. He is genuine, trustworthy, and steady. Plus he is smart and capable in ways that I never will be – he can fly a plane, pilot a boat, and figure out how to fix anything that needs to be fixed in our home.